I am back with another book review, today, I am reviewing Twenty Questions for Gloria by Martyn Bedford! Thank you so much to Penguin Random House for sending me an ARC of this book for review, all opinions are my own. If you read any of my status updates (and there was a lot, I'm sorry), you would know that I was about 20 pages into this book when I decided I was going to love it. I was sucked in by the allure, by the mystery, kind of like Gloria (eh, you see what I did there?). Anyways, I read this book in like 2 hours. I absolutely inhaled it. I couldn't put it down. This is the story of two teens, Gloria, and Uman (oo-maan <- the pronunciation is important! ), who run off together on an adventure, and only one of them returns. I really enjoyed both characters, Gloria was bored with her average life, and when Uman, the new kid, shows up, he turns her life upside down. She is normal, average, set to finish high school, get into post secondary, get married, have 2.3 children, etc. He is exotic, witty, and mysterious. And for some reason, untouchable. Teachers let him get away with everything. Eventually, you find out why that is, but for Gloria, she finds him intriguing. Annoying at first, but intriguing. Side note: The reason behind Uman being able to do whatever he wants is so heartbreaking. And you can see how that tragedy has shaped Uman and his personality. He doesn't want to become like that. He wants to be different, in every sense of the word. I don't really want to talk too much about plot, because I feel like this is one of those books where you don't want to know too much going into it. Layout wise, I enjoyed it. We find out pretty much right away that Gloria is the one who comes home, and we don't know what happened to Uman. The book is basically Gloria telling the detective at the police station what happened in the 15 days she was missing. I really enjoyed Gloria's voice, and even though there are some interruptions from the detective and Gloria's mom, we get to hear everything from Gloria's perspective. 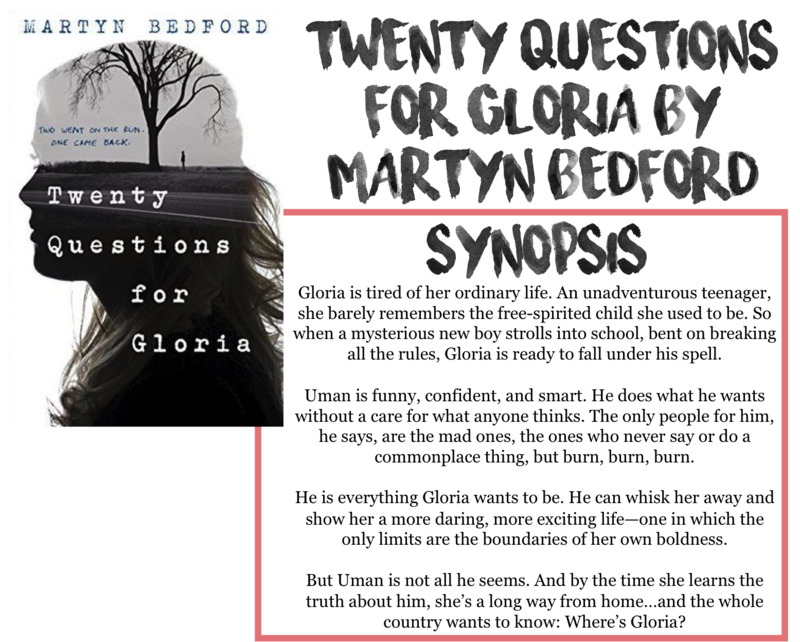 You don't really find out if Gloria was taken, or if she went willingly until later on, and I was afraid that some of Gloria's descriptions and explanations were a result of a bit of Stockholm syndrome, defending Uman and his actions. Again, I won't say too much, but I was happy with how it turned out. Now, I said at the beginning of this review that I knew I was going to love this book. And after thinking about it, I think I am wrong. In a sense, I feel a little like Gloria. I was intrigued and enthralled from the beginning, but as time went by, and reality sunk in, the appeal lessened. I don't know if it was just because I read it in one sitting, or if I was experiencing the reality check along with Gloria and Uman towards the end, but the story lost some of it's magic. Don't get me wrong, I really enjoyed this book, and I will definitely be picking up a finished copy, but I just didn't love it as much as I thought I once did. And I think there are some parallels for Gloria. She realized that she didn't want to live her life the way she and Uman were living it, and in the end, she will still look back on their time together and enjoy it in a sort of bittersweet way I think about this book.